Right behind chocolate cake, I think tiramisu ranks right up there on the list of desserts to do. Rob Reiner in "Sleepless in Seattle" remarks to Tom Hanks "You'll find out." So the mysticism of tiramisu, as I've discovered, is simply how well the mixture of flavors - the cream, the vanilla, the buttery cake, the coffee, the cocoa - all fit together. 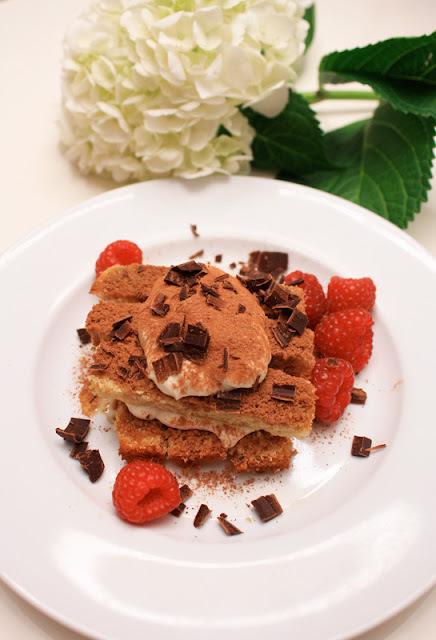 There's several ways to approach making tiramisu, and like everything else I try - I experiment. This one is an unstructured one with homemade ladyfingers. It is much easier to make than most people think. In a bowl, mix the mascarpone, vanilla and sweetener until smooth. The cheese will become softer and looser, which is fine. On the plate, place 3 ladyfingers. Using a teaspoon, drip or spread 1 tsp espresso (and liqueur if using) over the cake. Dollop a layer of the mascarpone on that. 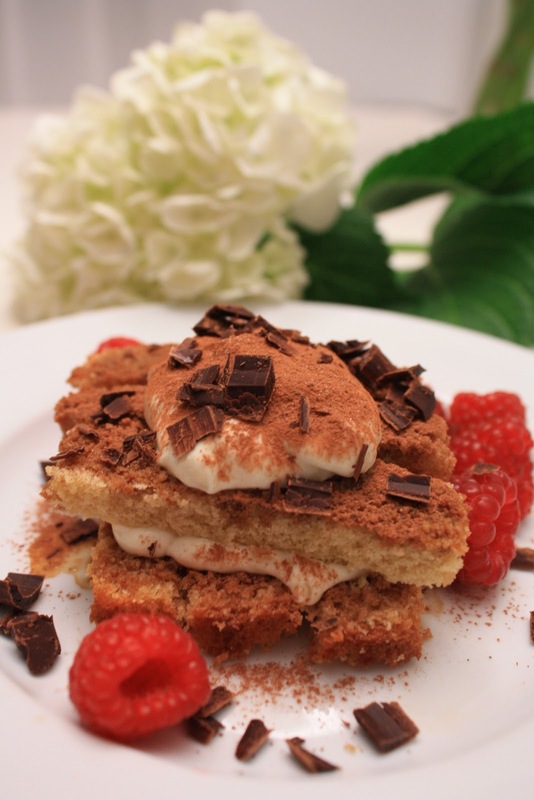 Repeat the ladyfingers, then the mascarpone again. Refrigerate for at least 30 minutes, but not more than 6 hours. Before serving, sift a generous layer of cocoa powder on the whole plate, then sprinkle with the shavings. Add a couple of berries for garnish. Ladyfingers are a sweet, light spongecake. You need to use the soft ones, which are not always available in the store, or at least can be difficult to find. Trader Joes sells a really good package in the fall. Alternatively you can use pretty much any light spongecake (somewhere between angel food cake and regular cake). To make chocolate shavings, use a bar of chocolate (best if you use a good dark chocolate like Valrhona or Scharffen Berger) and chill it. On top of a piece of wax paper or parchment, lay the bar face down. Holding it with a paper towel, run a sharp paring knife along the edges slowly and shave off pieces. You can also use a (well cleaned) vegetable peeler. Chill the pieces to keep them from melting. OMG! Looks delicious! Must try this recipe!